Giverny (Живерни) — небольшой милый, типично нормандский городок на пол пути между Парижем и Руаном, в окрестностях Вернона. Если бы не приезд художника-имперссиониста Клода Моне в 1883 году, он, наверно, так и остался бы тихим провинциальным местом. Но долгие годы жизни, которые Моне провел в Живерни, превратили городок во всемирно известное место художественного паломничества, еще даже при жизни Моне, — по улочкам Живерни в свое время гуляли Ренуар, Матисс, Сезанн, Писсарро. Моне прожил в Живерни с 1883 года до самой своей смерти в 1926 году. Он разбил возле дома великолепный сад, источник своего вдохновения, и рисовал его вновь и вновь, пытаясь отобразить разный облик сада при разном освещении. Каждый месяц сад выглядит по-разному, но лучшие месяцы для его посещения — это май и июнь, когда вокруг пруда с кувшинками цветут рододендроны, а над знаменитым японским мостом играет красками глициния. В зимний сезон музей закрыт. открыт каждый день с 23 марта по 1 ноября 2018 года с 9:30 до 18:00.
последний вход в 5:30 вечера. Из Парижа в Живерни: на поезде с вокзала Paris Gare St-Lazare (платформы справа — SNCF — Grandes Lignes) до станции Vernon (ветка Paris / Rouen / Le Havre, ок. 45 минут в пути), далее на такси (15€) или на автобусе. Его расписание согласовано с прибытием поездов, можно купить комбинированный билет на поезд и автобус на вокзале Сен Лазар. But if you can read english and french — you are welcome! 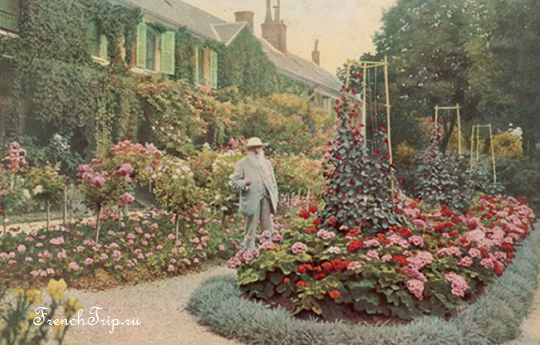 Monet designed several exuberantly colourful gardens, getting his enlarged new family to help him. His most ambitious project was to create a garden with lily ponds, which caused discontent among some local people, as it involved shifting the course of a stream. Monet was not seeking specific inspiration with this new plan, but once the ponds were flourishing, they led to his very finest paintings –Les Nymphéas, a series loved across the planet, and that put little Giverny on the world map. Monet had become a hugely admired artist by this time. A colony of followers came to visit him in Giverny, changing the face of the village. Monet lived here up until his death in 1926. Following Monet’s disappearance, his property gradually fell into decline. Thanks to generous donations, especially from wealthy American patron Walter Annenberg, the house and gardens were beautifully restored. They have become a magnet for huge numbers of tourists, along with a second, related art museum, also set up thanks to generous American donors. Franco-American artistic links go back a long way at Giverny. American Impressionist Theodore Butler became a good friend of Monet’s here and would, in due course, marry two of his stepdaughters. The picturesque village of Giverny still draws artists as well as an art-loving crowd, as you can see from its galleries, plus it has many welcoming teashops and restaurants. Claude Monet’s House and Garden The home of the Master of Impressionism, now restored, has regained the colours, the furniture, the Japanese prints and the china that Monet loved. Facing the house and studio, the Clos Normand walled garden displays a breath-taking palette of flowers and colours. The water garden, with its Japanese bridge, water lilies, wisteria and azaleas instantly bring to mind the brilliant interpretations of them Monet painted time and again. 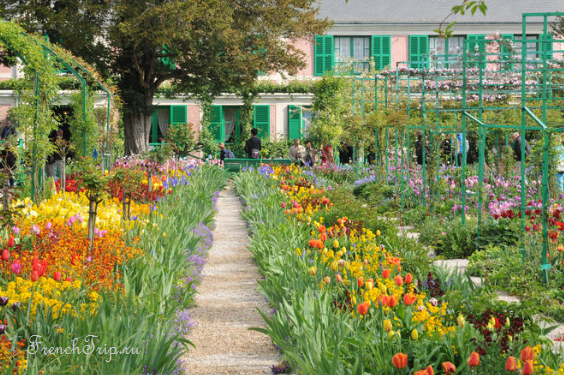 However, French President Georges Clemenceau, a friend of Monet, summed up the importance of the estate when he declared that Monet’s gardens counted among his masterpieces. Musée des Impressionnismes Giverny The main aim of this museum is to promote the international nature of the Impressionist Movement, paying particular attention to the Giverny colony and the artists of the Seine Valley. The museum also traces the history of Impressionism and Post-Impressionism and highlights their influence on subsequent movements in the 20th century. The Hôtel Baudy When Monet was alive, artists including the likes of Cézanne and Rodin poured into Giverny to get close to the Master of Modern Art. Many stayed at this house, which became a place of artistic legends. The Hôtel Baudy is now a café-restaurant. 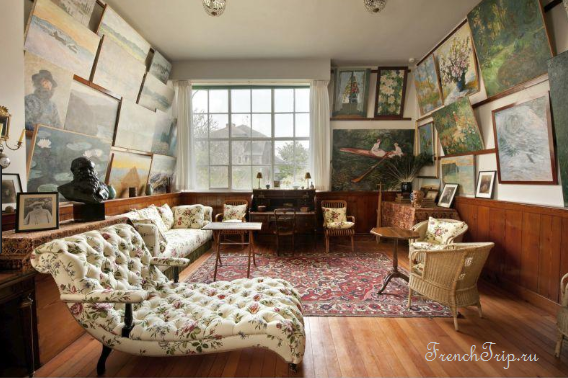 Monet’s House (Fondation Claude Monet) , 84 rue Claude Monet, tel 02 32 51 28 21, open April-October Mo-Su 9:30 am — 6 pm, admission €9.00, €5.00 students, €4.00 disabled, under-7s free, wheelchair access available — e-ticketscan now be purchased online to avoid queuing — the house is quietly eccentric and highly interesting in an Orient-influenced style, and includes Monet’s collection of Japanese prints. There are no original Monet paintings on the site — the real drawcard, is the gardens around the house — the water garden with the Japanese bridge, weeping willows and waterlilies is now somewhat iconic. Monet’s house has the obligatory gift-store attached, designed to help you part with your money in exchange for all manner of things Impressionist. An enormous number of people visit these sites all through the year. We recommend morning visits, so that you may visit the gardens during a quiet moment. An adult entry to the Giverny Impressionisms Museum costs 7 €, whereas tickets for children over 12 cost 4.50 €. An adult entry to the Claude Monet House and Gardens costs 9.50 € and 5.50 € for children over 7. 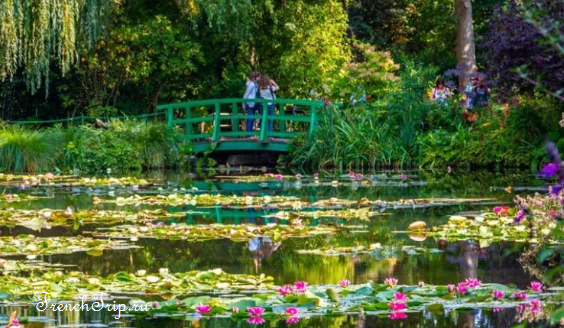 Musee Monet + Musée des Impressionnismes Giverny — 17 € (children — 9 €). 29 марта — 2 ноября: ежедневно 10 — 18, открыто по праздникам. 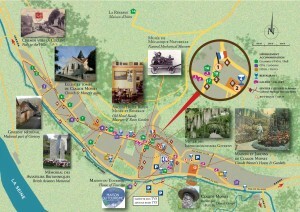 The Natural Mechanical Museum , 2 rue Blanche Hoschedé-Monet, Phone: 02 32 21 26 33. 27620 Giverny. Association under 1901 law, founded by the Guillemard brothers: Jean-pierre, René and Gérard currently run restorations and exhibitions with the help of an enthusiasts team who devoted their time and known-how to the Patrimony preservation. 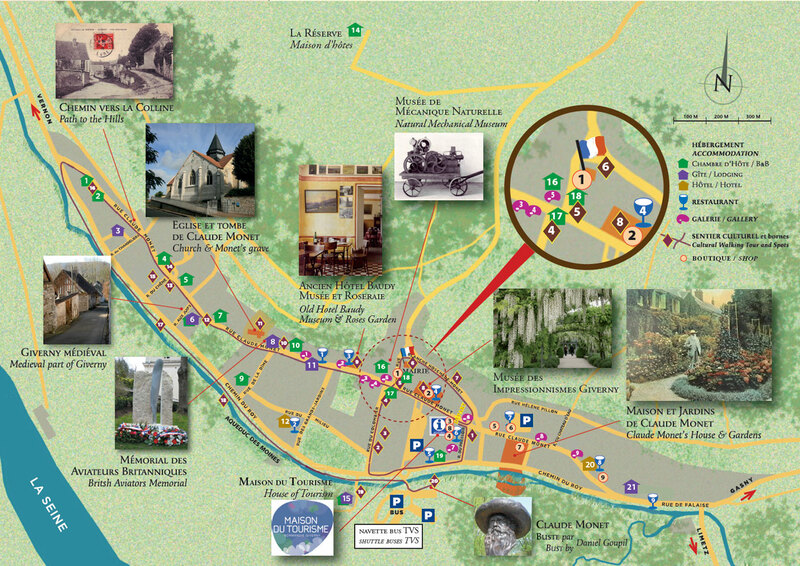 The museum origin is a private collection of steam internal combustion engines; founded in 1955 by the Guillemardfamily a GIVERNY resident’s since generations. Former threshing entrepreneur and blacksmith ADOLPHE Guillemard has transmitted to his children his know-how and passion for the vintage mechanies. Along years, purchasing, donations of engines pile-up awaiting for the needed parts or just a time to restore. Since 1982 the number of collected items inereased due to closing of workshops, factories or mills. The preservation of these engines was a rescue task, numbers of testimonials items already gone. In 1990 the collection find home in the actual local where the engines are in permanent show, installation of the Carels 1908 diesel engine weighting 28 tons keep the team busy for months on overhauling and restoration; it becomes in 2003 the world bigger old running diesel engine. Le 6 et 7 septembre 2014. 9 ème EDITION DU FESTIVAL INTERNATIONAL DE MÉCANIQUE. Exposition vivante et démonstration de moteurs, tracteurs et voitures anciennes à l’Espace BAUDY, présentés par leurs restaurateurs, dans le cadre des journées du patrimoine. Le samedi de 14h à 18h et le dimanche de 10h à 18h. Entrée : 3 euros – Gratuit pour les moins de 13 ans. Restauration artisanale sur place. HISTOIRE :VISITE VIRTUELLE 360° : ICI L’origine du Museum est une collection de moteurs à vapeur ou combustion interne commencée en 1955 par la famille GUILLEMARD de GIVERNY…. Первый приход во главе с церковью святой Радегунды был основан во время правления Меровингов, в 9 веке.